My husband and I love snorkeling in the Caribbean, so that was a top priority when we visited Turks and Caicos on a romantic getaway. Smith’s Reef in Turks and Caicos is teeming with sea life just yards from the shore, making it a great destination for snorkelers of all abilities to explore. The highlight of our days snorkeling on Smith’s Reef was seeing two beautiful eagle rays, but there are also colorful fish, turtles, lobster, and corals. This is the most accessible snorkeling on the island of Providenciales, but because Smith’s Reef is very long and has three access points, you need some tips to find the best snorkeling spots. For prime beachfront accommodations, I highly recommend the Atlantic Ocean Beach Villas right on Smith’s Reef. We didn’t realize until our third day that we were in the perfect spot to enjoy the best snorkeling on the island, because we didn’t know what we were looking for. These tips should help you find the reef much faster than we did. The first time we got in the water, we spent 45 minutes snorkeling over lush fields of sea grass, with very few fish to enjoy. Darker patches in the water are sea grass, and the lighter brown spots are the corals. Turquoise water indicates a sandy bottom. There are 4 or 5 very good coral spots, each separated by vast patches of sea grass. When you are making your snorkeling plan, focus on getting to the light brown patches. We saw many people spend a lot of time snorkeling all over the sea grass. Make sure to find the corals or you will miss the sea life. Eagle Ray we found at Smith’s Reef. There are 3 beach access points at Smith’s Reef: two on Coconut Road and one off of Lower Bight Road. We recommend the middle entrance at the far east end of Coconut Road. Walk west up the beach (toward the marina). This entrance is near the Atlantic Ocean Beach Villas. Here are some landmarks from our favorite spots near the middle entrance. If you can identify these landmarks from shore, it is easier to look up and identify if you are still on track to find the corals you are looking for. The corresponding pictures here will hopefully help you identify the spot where you swim directly out towards the coral. They are taken from the water to give you an idea of the view you should see as you look back toward shore. 1. Three White Houses. On any Smith’s Reef map, this reef will show up as the smallest reef. Go to the three whites houses (pictured below) and swim directly out. When you think you’ve gone too far, keep swimming. You will pass a sandy channel and then arrive at the corals a couple of hundred feet from shore. Just keep swimming straight out from the three white houses, and you will hit BIG wonderful reefs teeming with fish. In the sandy areas we saw several stingrays as well. The home on the left is the house we stayed in at the Atlantic Ocean Beach Villas. 2. Two Docks. This reef was the easiest to find from the shore. Corals are a bit more patchy but we saw lots of fish, and this was where we saw two massive eagle rays that were stunning. I would the prime spots are about 100 feet off shore directly out from the two wooden docks. Please pardon the photo quality here. The GoPro had enjoyed several hours of snorkeling at this point in our day. Look closely and you can see the two wooden docks. 3. Spanish Hacienda. This area had more expansive reefs, but seemed a little smaller than others (shallower water), but still had great things to see. You will see black rocks on the beach that seem to be an extension, since the reefs start just about 30 feet into water. 4. Modern house. About at the “corner” as you get towards the marina exit point. This is still a walk right/east from the parking lot at the WEST end of Coconut drive. The reefs are closer in here as well so great snorkeling is close to the shore. Once you get the feel of the reefs, try swimming laterally to follow the reefs. This line of coral is about 3000 feet across the whole coral field, with large patches of sea grass in between. Plenty of boats bring snorkelers to Smith’s Reef. Be aware of the boat lanes and do not go out beyond the buoys. Internet and WiFi was spotty at best at Smith’s Reef. There are some maps posted, but I found them confusing and hard to read. If you want these directions, I recommend you print them in advance and carry them with you. There are inherent risks associated with any snorkeling trip. Please do not touch the coral as human touch will kill them, plus you can get some nasty scrapes and cuts. You will likely see lion fish, and you should steer clear of them since they are poisonous. I have snorkeled near dozens of lion fish and they will not hurt you if you don’t touch them. When we snorkeled at Smith’s Reef, there was a bit of wind that made the water choppy. Be aware of wind and wave conditions, make sure those who need it have proper flotation devices, and enjoy the reefs. We saw almost as much sea life at Smith’s Reef as we did scuba diving in West Caicos. Best of all, it was free and open to the public, and we could snorkel for as long as we wanted! Need a place to stay? Atlantic Ocean Beach Villas is an affordable option right on Smith’s Reef. Check TripAdvisor.com reviews and rates here. Need snorkeling equipment or other gear for your trip? Check the selection and prices at Amazon.com here. Need travel insurance? Anything could happen between now and your trip! Insurance buys peace of mind. Check rates at Allianz and RoamRight. Thank you for posting this. Our family is visiting Provo next week and we are definitely looking forward to Smith’s Reef. Are there other “must see/do” things for families (two daughters – ages 11 & 14) while we are there? Glad you found this helpful! I hope you see amazing things like we did at Smith’s Reef. We visited the Caicos Conch Farm … short but interesting tour of conch farming in T&C if you are interested. I think most people go for the beautiful beaches, amazing water sports, and good restaurants. I’d recommend a catamaran sail with your kids if you haven’t tried it before. They are fairly easy to navigate (you can take usually take a lesson and then rent one for an hour) and it’s a fun way to experience the water. We had dinner on the sand one night at Mango Reef restaurant and that was a fun experience to eat right by the ocean. (You might want a light jacket in the evening by the water.) Enjoy! 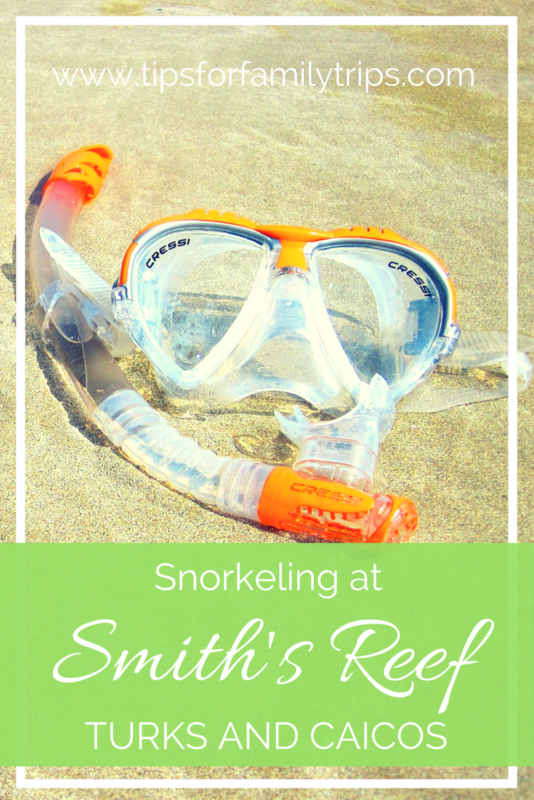 I’d love to hear what you think of the snorkeling at Smith’s Reef. We spent most of our trip in the water either snorkeling or diving. Thank you! I’m looking at Atlantic Ocean Beach Villas thanks to your site : ) I did read that this area of the island is windier – is that an issue for swimming/snorkeling? Also, what time of year have you gone? I’m considering Thanksgiving. We were there in for four days in early March, and there was some wind when we were there, but I still felt comfortable snorkeling. I noted that the wind may have made it harder for younger kids to snorkel, but I spent a hours snorkeling and felt safe and comfortable. I’m sure on a strong, windy day it could be a bit of an issue, but hopefully if you’ve got a few days you will find times you can snorkel. Good luck. Really loved this little gem of a place! I too appreciate this info. I’ve visited the Island about six times and snorkeled Smith’s Reef each time. I always seem to spend a lot of time looking at sea grass trying to find the reefs. I will definitely take your advice and print and carry this with me next time. Another spot folks may consider very close to Smith’s Reef is Bight Park. After parking your car, walk over to the left side of the park (by the bathrooms) and head straight for the water, that’s not a bad snorkel. Plus it’s easy access.and a nice beach too. Hi we checked out your first spot today at it was amazing! Where are the 2 docks location on the main reef map? I hope you found the wooden steps / docks. It’s been a few years since i was there, but I poured over the satellite maps and believe it is at these coordinates: 21°47’16.1″N 72°13’25.9″W That is my best guess from the satellite view. If you walk along the beach from the 3 white houses toward the marina at the end of Smith’s reef, you should find the docks and then can swim out from there. Happy snorkeling! If you find it or have better directions or coordinates, would love to hear from you! We went the yesterday and found the spot. Amazing snorkeling! We saw turtles and a really big eagle ray!